Norma Mullins, beloved mother, grandmother, and great-grandmother went home to be with the Lord on April 2, 2019. 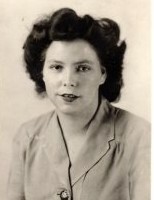 She was born on December 8, 1925 to G.W. and Eliza Moore in Wise, Virginia. Norma was preceded in death by her husband of 66 years, Jackson Mullins. She leaves behind daughters, Jackie Carol (Jerry) Plate, Billie (Richard) Davies; son, Darrel (Jeanne) Mullins; grandchildren, Amy (Mark) Troyer, Meredith Hines, Jill Perry, Corey (Ashlea) Mullins, Codey Mullins, Christina (Christopher) Cranor; great grandchildren, Abby, Ryan, Drusilla, Marcus, Rachel, Noah and Stone. Visitation will be 2:00 until 4:00 p.m. Sunday, April 7, 2019 at the Donovan Funeral Home, 17 Southwest Ave. (on the Historic Tallmadge Circle. Funeral service will be 10:00 a.m., Monday, April 8, 2019 at the funeral home with Pastor Steve Bucy officiating. Interment will be at the Ohio Western Reserve National Cemetery.